Shopping for iZombie Action Figures? You only Liv twice! As a doctor who became a zombie, Liv Moore is the focus of the hit CW show iZombie, in which she solves crimes by eating the brains (and memories) of the victims. And now she's the newest action figure from Diamond Select Toys! 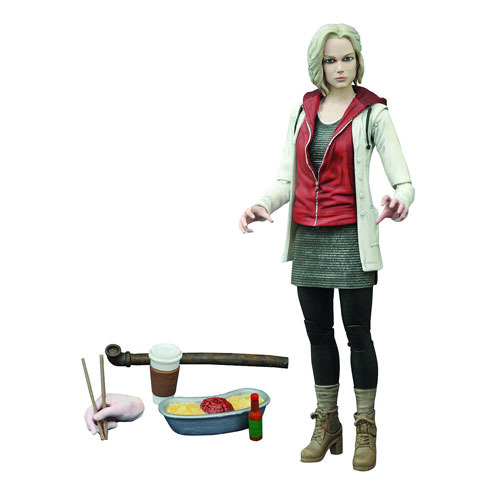 Sculpted in a 7" scale, this Liv Moore action figure includes both regular and red-eyed zombie-rage heads, plus an interchangeable chopsticks-holding hand, as well as a pipe, coffee cup, hot sauce bottle, and a delicious brain casserole. The figure features approximately 16 points of articulation, and comes packaged on a blister card. Sculpted by Gentle Giant Studios! Measures 6-inches tall without stand. Ages 8 and up.